Archive News: Wildlife babies: Please leave them alone! WILDLIFE BABIES: PLEASE LEAVE THEM ALONE! The New Mexico Department of Game and Fish receives numerous calls each year from concerned individuals who find what they think are orphaned or abandoned antelope and deer fawns and elk calves. Many of these same people pick up the animals and take them to local veterinarians, zoos, or their local Game Department offices. While these individuals have no intention of harming these young animals, people need to realize that picking up these babies greatly decreases their chances of survival. and even elk along the highways and roadways. These animals are looking for the only green vegetation that is available. Unfortunately, due to the lack of moisture, the only green forage that many animals can find happens to be along the edges and medians of our roads and highways. Normally antelope, deer, and elk will move away from any type of human presence to have their young. Given the current dry conditions and lack of forage in their normal habitats many animals are having their young where they are able to find decent food. This year, many antelope in southeastern New Mexico are having their young in the bar ditches and even the medians of our highways and roadways. Deer and elk could potentially do the same in the next couple of months. Deer, antelope, and elk all leave their young alone while they move off to forage for food and water. The young are normally left in areas that provide good cover and relative safety. The fawn or calf may be left alone for several hours or more depending on cover availability and distance mom has to travel for food and water. Mom will return to the young when she feels that it is safe to do so. If you find a fawn or calf, please leave it alone. Don’t touch it, and by all means don’t pick it up. Leave the area and eventually the mother will return. 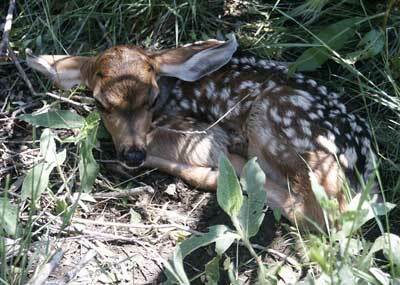 If you find a fawn or calf in the middle of a roadway, gently shoo it, without touching it, out of harms way. The best thing that you can do if you find a fawn or calf that you think is orphaned or abandoned is to contact your local conservation officer or Game Department office. Let a conservation officer take care of the animal and make the decision on what action to take. Furthermore, it is unlawful to pick up game animals or any protected species, of any age, without a proper permit or documentation from the Department of Game and Fish.